Considered one of Seattle’s best day tours, the Whale Plane Package includes – Round trip air on a Kenmore Air seaplane from downtown Lake Union, Seattle to Friday Harbor for a San Juan Safaris Whale Watching and Wildlife Tour by boat. Choose from these tour options and book your adventure today! Join the crew aboard the M/V Sea Lion for a memorable trip for the whole family. This flagship tour lasts 3-4 hours and is the best tour for young children, the elderly, and large groups. Aboard you will be joined by marine naturalists who will answer all of your questions as you search for orcas, humpbacks, eagles, sea lions, porpoise and more! This M/V Kestrel is a RIB (ridged inflatable) style vessel that can cruise across the local waters around San Juan Island at an impressive speed of 35 knots. The adventure tour lasts 3 hours and offers a chance to see a wider view of all that the San Juans have to offer. Marine naturalists are on board to answer your questions and teach about the local wild life and ecology. Stay warm and cozy in the provided exposure suits as you speed across the waters in search of orcas, eagles, seals and more! Kenmore Air, which has been operating Sea Planes for over 60 years, takes off from the seaplane base on Lake Union near downtown Seattle. Lake Union is a short taxi ride from most area hotels. Flights last approximately 60 minutes and are fun and scenic. View mountains, ferries, island, and mountains from above as you travel to San Juan Island. 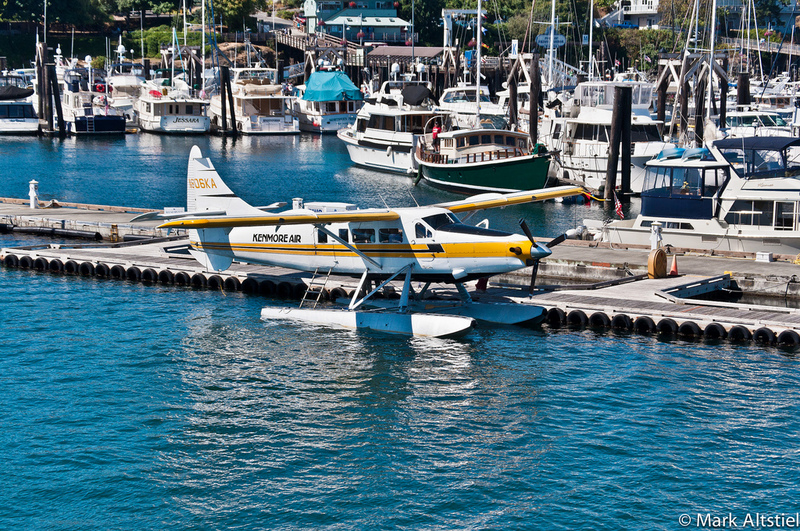 The seaplane lands on the docks in the Friday Harbor Marina, just a short walk from the San Juan Safaris office location. There is time before and after the Whale Watch and Wildlife Tour to enjoy the town of Friday Harbor where there are many restaurants, shops, galleries, and museums. You can return via seaplane to Seattle after the Whale Watch and Wildlife Tour, or at a later date! San Juan Island has many great hotels and B&Bs.